& from Belgium / België / Belgique including Etterbeek. This LP is from a one owner jazz collection. The cover has clear laminate with no sign of lift which allows the image to retain its sharpness and the vibrant colours to still shine, with just a few small laminate creases at the spine & bottom edge the only concession to age. The spine is still proud and the text clearly legible. The reverse is still a glorious off-white with just the odd spot of discolouration, with nothing to spoil the overall condition. The flipbacks are all secure & intact with just a little light discolouration adhering to the glued areas. There is a small catalogue number annotation made by the previous owner in the top right hand corner in pen and is unobtrusive. The sleeve is a stunning example & is graded as Excellent. The heavyweight vinyl has received a deep clean on a high end Matrix machine. The vinyl has a number of light paper scuffs & hairlines which mostly look as if they were made by taking the record in & out of the paper inner; due to the quality of sixities vinyl these have minimal impact on sound quality. Overall the vinyl retains a rich sheen & looks fantastic. The rough black label shows no real sign of spindle wear, indicating light & careful play. The vinyl is graded EX/EX-. The high standard of sixties vinyl really makes these pressings extremely desirable and sought-after. This is a wonderful example, the type that only surfaces when the gods are smiling! 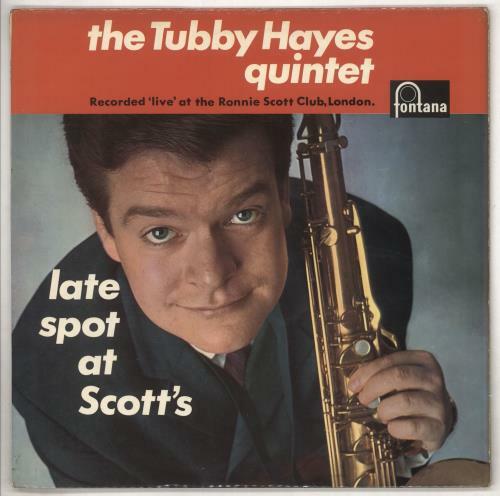 Product Information Tubby Hayes Late Spot At Scott's - 1st - EX UK vinyl LP album (LP record).